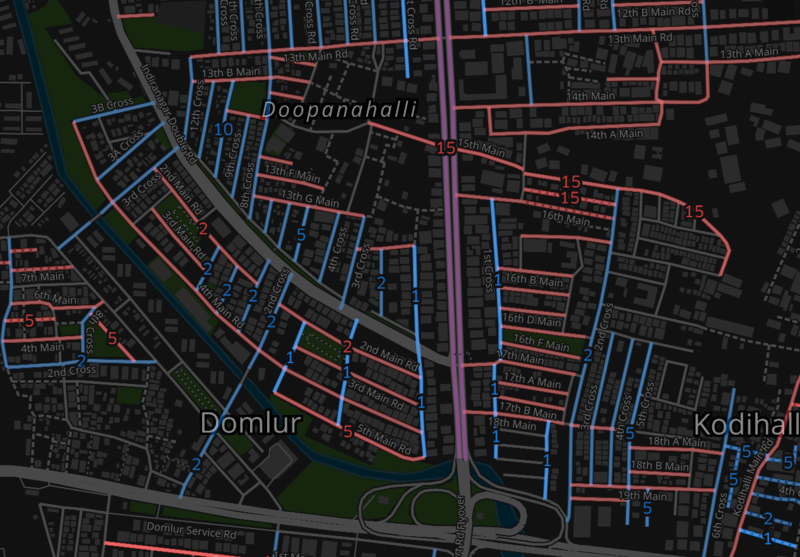 Street names in Bengaluru are usually named mains (red) and crosses (blue) and is a constant source of confusion for new residents due to inconsistent numbering system across neighbourhoods. The British company PIE Mapping have started contributing to OSM ( by splitting various highways). The Data Working Group had to intervene via twitter, since their data editors seem to have ignored the comments on their changesets, tweets and emails as well. Martijn van Exel at Telenav reports in his blog about the results obtained during the Flash Map Mob. To visualise results, Martijn used this interesting Overpass Query. Pratik Yadav writes a diary in light of the previous post by Planemad and MAPconcierge about major road realignment issues in Japan. OSM Japan community is now focusing on fixing roads in Tokyo and surrounding areas. Arun Ganesh from the Mapbox data team releases the mapping wiki, which consists of mapping guides in English and Spanish languages. One can join any of the open mapping projects through the issue queue maintained in this wiki. Martijn van Exel writes about his first experience with audio mapping and asks the community to share their experiences and suggestions. The tag aeroway=heliport has been approved. However, currently there is not even a single instance of its usage on OSM. Danial Ko? suggests how the wrongly tagged objects could be corrected. User species talks about mapping directions for give_way and stop_sign nodes. An interesting discussion in YCombinator on why OpenStreetMap is not used more in “public-service mapping projects”. Mapbox Bengaluru, celebrated International Open Access Week, last week. The week was celebrated with Missing Maps event to collaboratively map parts of the Democratic Republic of Congo. Also, a data art gallery was organised where the collection of projects made by data activists from India were displayed. OpenCage Data Blog interviews Mark Iliffe and Geoffrey Kateregga about the State of OSM in Tanzania. International Business Times interviews Maps.me’s CEO, Yury Melnichek. Mikel Maron writes in his blog about the importance of Open data, the enormous speed with which the data can be improved and about fundamental principals of the community. “Urban Areas: a meditation on why simple global geographical datasets are so poor” by SK53. Federico Cortese announced an import of buildings in Apulia/Süd-Ost-Italien. Courtney Rieger asks on Imports mailing list if hydrological and hydraulic models could be imported into OSM. She gets no as an answer. After the start of long-time prepared re-import of all administrative boundaries in Mexico, a lot of trouble occurred with the outer border to the USA. Meanwhile the damage has been repaired. Outstanding changes of the boundaries with Guatemala and Belize will be watched carefully. Øystein Bjørndal announces an import of daycare facilities for children in Norway. So far nobody has contributed to any feedback on the mailing list. To manage the import, Øystein considers using the POI-Importer tool. Ian Dees, Alex Barth, Alyssa Wright, Martijn van Exel and Drishtie Patel are the new board members of OSM-US. “Teach, Learn and Discover Geography With OpenStreetMap” event is happening during the Geography Awareness Week, Nov 15-21. It is open for everyone, anyone from schools, colleges, universities can participate in this. HOT and Missing Maps are aiming for (at least) 100 mapping parties, mapathons, mappy hours and mapternoons happening all around the world. On October 23, Marble announced the shipment of the oldest existent historic Globe. The Behaim Globe was created around 1492. The Germanisches National museum in Nuremberg has allowed to use the photo scan material under CC BY-SA 3.0. Benutzer ngyuenc presents a WebGL-based simple simulator using OSM. The historical maps of the US Geological Survey are now largely digitised and are downloadable on the USGS site. The Marble Project is working on client-side rendering of OSM data based on vector tiles. The function is currently under development. There is a guide on how to compile Marble with vector tile support, a guide to produce vector tiles from a PBF file and an info page on implementation of vector tile support. osm4j was recently released, it is a light weighted Java framework for working with OSM data. osm2pgsql switched from autotools to cmake. Peter Richardson in Mapzen’s blog, explains about projections other than Mercator with some Tangram based animated graphics and maps. “MapQuest wants you to love it again“, a blog post by Nate Swanner at TNW News. MapQuest is launching a redesigned web platform which will try to make maps personal, contextual and as smart as you want them to be. Edgar Alvares reported at Engadget, that Uber (you remember the takeover of Bing Maps) now “starts rolling out its own mapmaking cars”. Why would you use OpenStreetMap if there is Google Maps? Aleks Buczkowski has a very good answer to this question. You can obtain necessary knowledge about OpenStreetMap with LearnOSM. A blog post by Aleks Buczkowski explains, how wireless carriers are making money by selling your location.